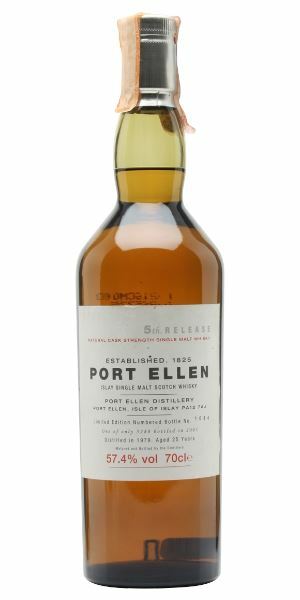 As we all get used to the fact that Port Ellen will soon be making whisky again, Dave Broom continues his reappraisal of the annual releases that did so much to create the Islay distillery’s legend in the first place. 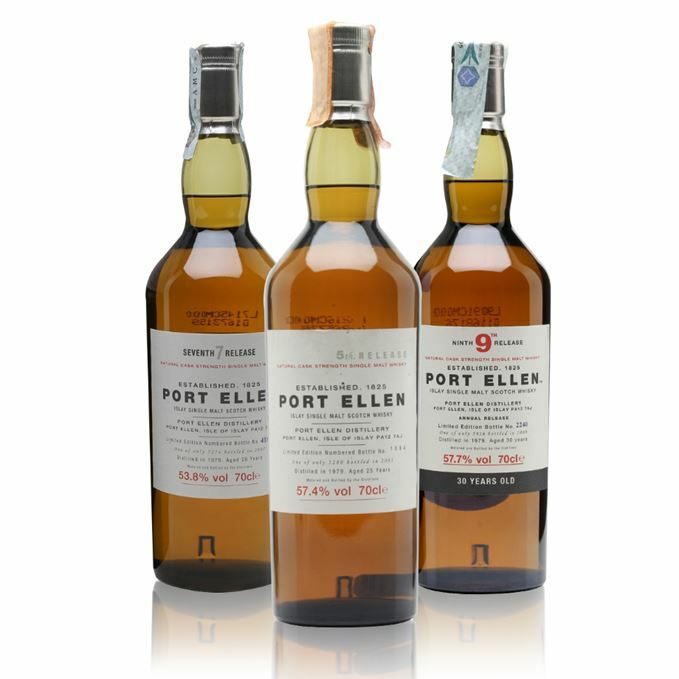 This particular trio – the fifth, seventh and ninth in the series – were all distilled in 1979, four years before Port Ellen’s apparently final closure, but bottled at different ages and varying strengths. Regular readers will know that Broom recently questioned the greatness of some of these bottlings (see Rare Batch 26 and an assessment of the first, second and fourth releases), pondering whether there wasn’t an element of the Emperor’s new clothes about them. There’s slightly more colour than on the previous trio, plus a light smokiness and some typically oily notes that bring to mind fish and chips wrapped in newspaper. Initially, this is the most expressive of this trio with rockpool elements but also wet moorland (that grassy element seen in previous releases), but this is strong and there’s lots of nose burn. When water is added, the cask adds a brioche-like sweetness and a cinnamon-accented (Oddfellows dust) note which tries to pull away from the chalky bedrock. The smoke remains quite gentle. As it develops, so things take a more feral, almost foxy, turn that also hints at the farmyard, while those dried grasses come through more strongly. Go back once again and things have moved, as Port Ellen so often does, to the sea: fresh sea breezes, ozone. It smells ‘young’ and slightly rubbery. Good oily feel which helps texturally, but this is brutally strong and has the distillery’s characteristic rigidity by the time it hits the back-palate. That said, there’s just enough wood here to have pushed maturity along, but it’s relaxed enough to allow oxidation to give a manzanilla-like salinity. As the nose suggests, it’s actually quite light. Water is needed to turn the heat into a pleasing spiciness and add a light rooty quality on the end as it becomes darker and the peat smoke emerges more assertively: bloaters and tarry tea. When neat, quite short and slightly bitter, with some smoked almond. With water, some sweetness. It offers hope, then closes it down again. Still, it’s an improvement on the 4th Release. Wellies on, running along the beach. Quite closed, slightly citric and, as ever, oily. There’s actually more nose burn than the 5th Release, suggesting there’s less cask involvement. We’re now in sun-bleached wood-in-the-heat territory. Once again it comes across as firm and slightly restrained, but there are optimistic indications of sweetness behind, along with some lemon zest. The moorland effect seen on the 5th Release is now wet boots. When water is added, there’s a mix of rapeseed and peppery olive oil (a flashback to the 1st Release), while the smoke is, again, quite understated. Once again we end up beside the sea: shoreline, waves, sea foam. Things remain enigmatic, slightly hidden. Slow opening here and seems more expressive than on the nose. The sweetness which was suggested is now front and centre and, when the firm clampdown happens, it doesn’t give up like previous iterations but fights back – and this is a fight, a constant tussle between the dry and flinty and the soft and welcoming. Water releases the smoke and pulls out some mossiness (like the 4th Release), but there is always a sense of tension, that things are being held in check. There’s some salty white crab meat towards the back-palate. 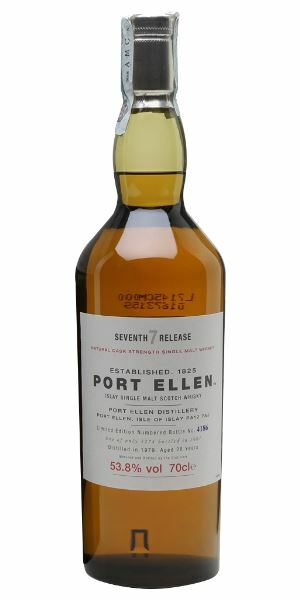 Go back for a final time and there’s just a hint of buttery oak and then that Port Ellen Arbroath smokie thing. Finally opens up to apple and soft fruit. There’s potential here. The effect is like walking into a dinner party just after the hosts have been having a raging argument. A deserted boardwalk in the sun. Tears on the face, cracked vinyl plays from broken speakers. Take it away, Aidan Moffat. This opens with a surprising – and welcome – blast of mintiness, some hot pepper and a tiny whiff of petrol, but it’s hard to get into. When water is added, it suggests that it is the biggest of the trio, but it offers bulk rather than expressiveness. There’s a saltiness – spume lifted from a wave. It’s recalcitrant, unwilling to reveal itself. Instead it looms like a gathering storm. The oak is firm and, while there’s more sweet and estery elements released with water, it remains in a sulk. Again, though, the palate offers more hope. Things are more open, slightly sweeter, there’s hints of bay leaf, linden, oil and touches of pandrops (that mintiness again). The bittering agents come through – gentian especially, and it retreats. Water helps to release seaweed, a mineral element and some of those massing phenols alongside the soft and quite sweet core and, as with the 5th Release, there’s a fresh zestiness towards the end. I added more water and picked up a softer, almost waxy element and more of that oxidised element also seen on the 5th, that’s now more manzanilla pasada. Dried grapefruit peel, then a tarry element. There’s positives here, but it’s more of an intellectual exercise than an immediate hit of enjoyment. There’s age, but freshness, a sense of decay (high water mark), some acidity, but this massive bank of phenol. Is it coming together or beginning to fragment? I think the former. There’s always an air of unfulfilled promise about these Port Ellens. One that’s tinged with regret. The question ‘what if?’ always hangs in the air when you taste. Maybe now that it’s got a third chance we can find out what it really can do. A seaside town at the end of the season. Rare Batch 28 14/11/2017 There’s a contemplative air as Dave Broom tastes old Glen Grant, Springbank and Tomatin. 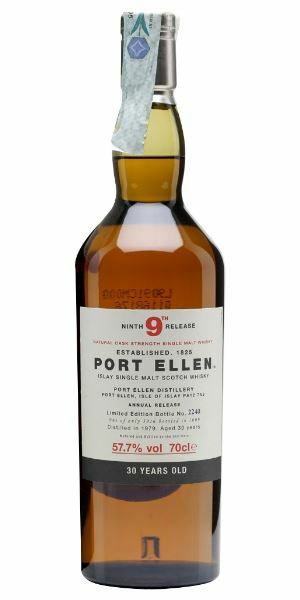 Rare Batch 26 25/09/2017 Dave Broom revisits three legendary Port Ellens, but wonders if the liquid is worth the hype.